With very little run-up distance, you can chain up two pedal kicks or accelerate on a smooth pedal up to assist your weight-transfers over the front wheel. Marc Caisso regroups over the front wheel. 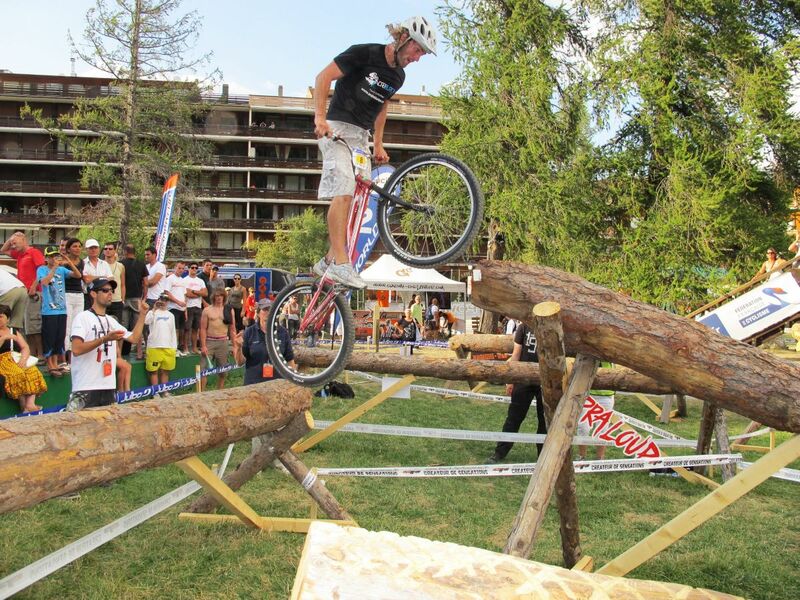 Andrei Burton aims the front wheel with precision. Getting your run up distance and timing right is important so you should first master the plain pedal hop, and also the variant where you climb on the front wheel from a standstill or from a standing position on the rear wheel. 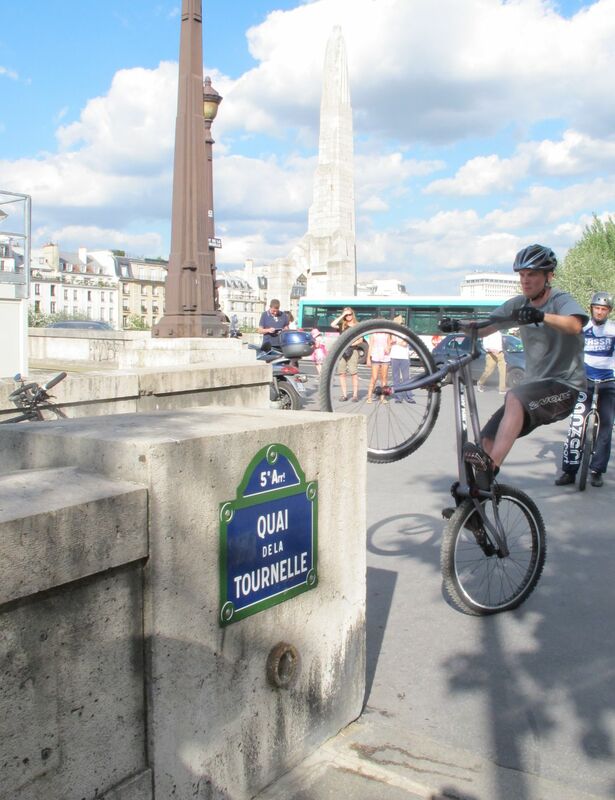 A fast pedal up or two successive pedal hops will boost your inertia so that when you pick the front wheel on top of the obstacle, you can thrust your shoulders more easily over it and use this extra momentum to tilt the bike forward before a wheel-swap. If you have enough run-up distance, try first with a smooth pedal up approach, putting more emphasis on moving your shoulders upward during the final acceleration. Once you understand well the nose-pick, try to gather moment with two pedal hops instead of using a pedal up. This approach is more difficult but also more versatile as you may not always have the full run-up distance necessary for a pedal up. In this case, two successive landing spots for the rear wheel will be just what you need to build up momentum before the nose-pick. Vincent Hermance during a warm up session. 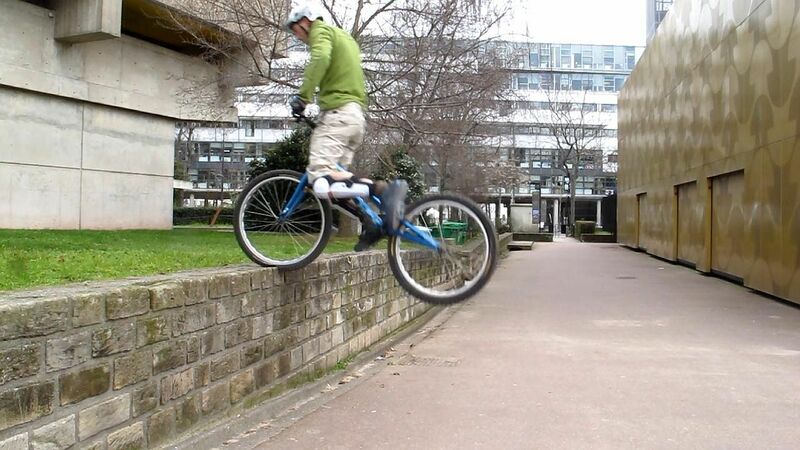 Rémy D. lands a first pedal hop to compress the rear tyre. Get your marks right with enough run-up distance to launch a long pedal hop landing fairly vertical at about a bike's length from the obstacle. When you land the first pedal hop, the bike tilts forward. Stay supple and crouch back to prepare for the second pedal hop, upwards. Spring up into a full vertical extension, thrusting your hips and shoulders upward with a strong kick on your front pedal. The vertical jump impulse combined with your horizontal momentum should bring your shoulders over the handlebars, with your abdomen right over the stem, arms stretched down. 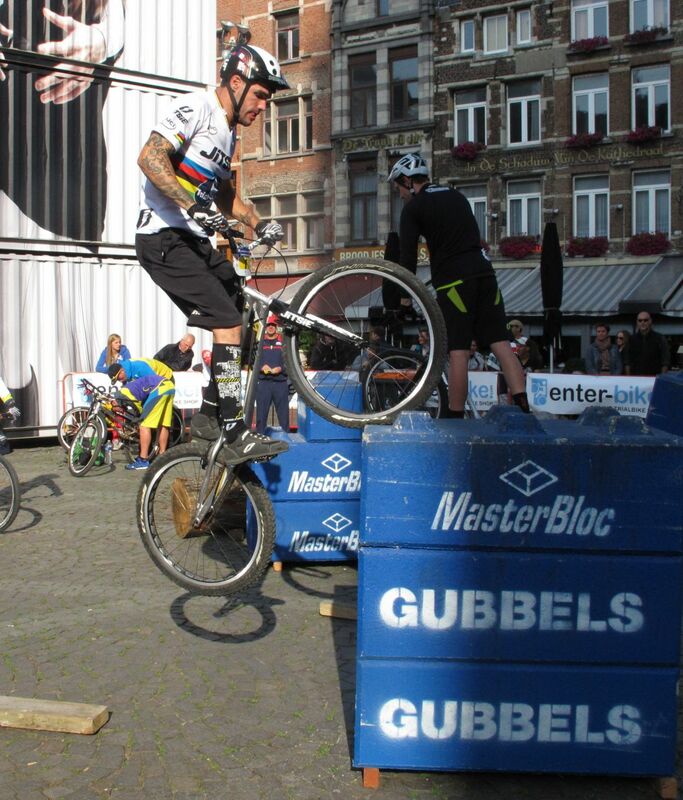 At the end of your extension, pull the bike up with you and aim the front wheel at the edge of the obstacle. When the front tyre hits the edge of the obstacle, lock the brake to tilt the bike forward with your momentum. Transfer your weight over the front wheel to lift the rear wheel further. Keep your shoulders moving forward and tuck your knees to bring your hips closer to the stem. 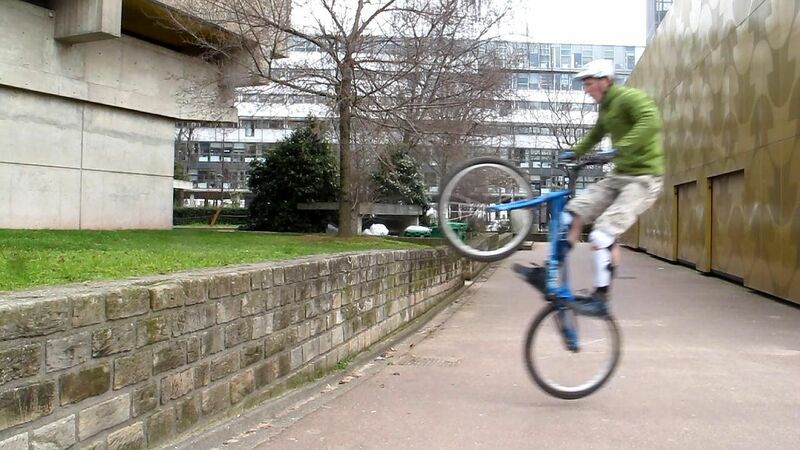 Then release the front brake progressively, extending your arms to roll the front wheel further and finish off the move with both wheels secured on the obstacle. Alternatively, if there isn't room for the full bike, perform a quick front-to-back wheel swap. 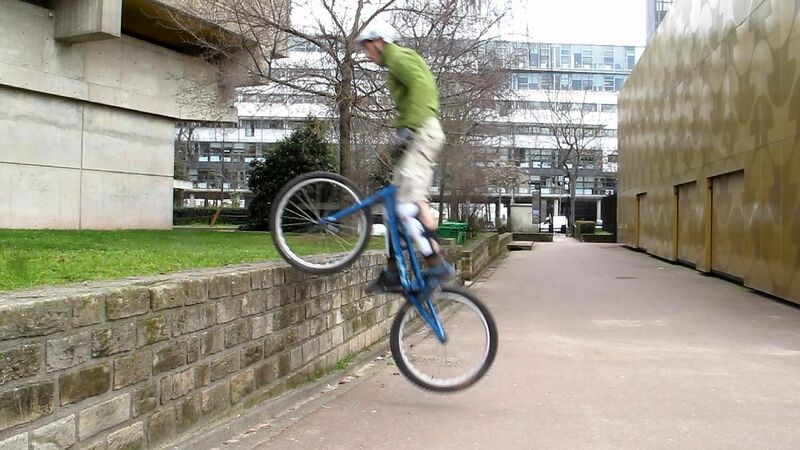 1° Get your marks right with enough run-up distance to launch a long pedal hop landing fairly vertical at about a bike's length from the obstacle. 2° When you land the first pedal hop, the bike tilts forward. Stay supple and crouch back to prepare for the second pedal hop, upwards. 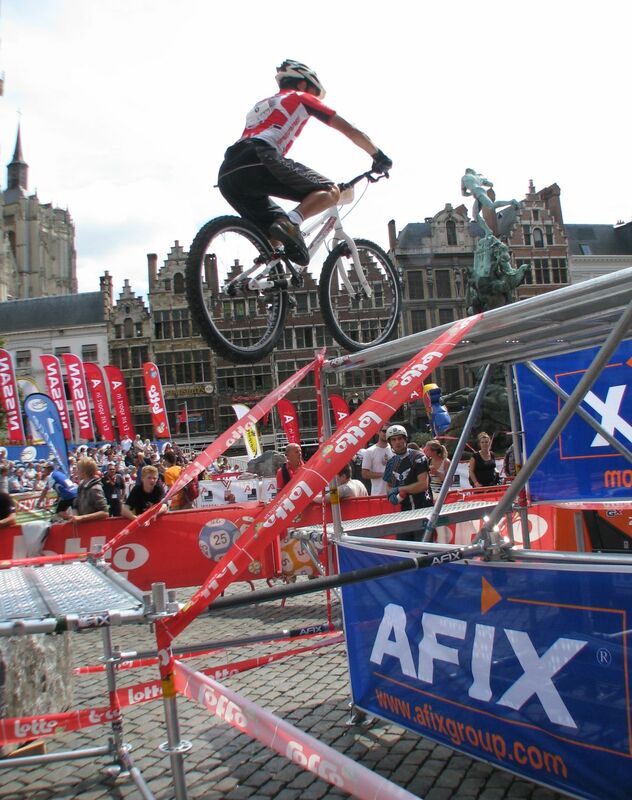 3° Spring up into a full vertical extension, thrusting your hips and shoulders upward while aiming the front wheel at the edge of the obstacle. 4° Pull the bike up with you and lock your front tyre on top of the obstacle, then use your momentum to tilt the bike forward, bringing your hips closer to the stem before a wheel swap.